EasyMorph comes only in a 64-bit version and only for Windows. EasyMorph works in the time-unlimited free edition mode unless a license key is applied. Compare editions. EasyMorph installer is designed to work without an administrator account. Correct functioning is not guaranteed if the application is installed into a protected system location (e.g. Program Files). EasyMorph checks for new versions by fetching a small file from our server. We count such requests to get a rough idea about how many people use EasyMorph. You can disable update checks entirely in menu About. All user data always resides in the user's computer. No data is sent to the cloud unless you explicitly chose to export data into a cloud application / database. No temporary data files created as all calculations performed in memory. It is advised to have >16GB of RAM if your typical datasets exceed 1 billion data points (i.e. rows x columns). Unary minus is currently not supported in expressions. Instead, write 0 minus the value (e.g. 0-5 instead of -5). Version 3.9.3 build 18 for Windows; 27,156KB (zipped). By downloading EasyMorph you confirm that you agree with the End User License Agreement. This is what keeps us busy for the next few months. Subject to change without notice. 4.0 Embedded project modules that can be used in iterations instead of projects. New actions: Web Request, Iterate Web Request, SharePoint Command, Create row. New connector: Web location. Desktop: Accessing/editing Server space repositories from Desktop. Highlighted headers for newly created and changed columns in action results. 3.9.4 New actions: Google Drive Command, Export to Google Sheets, Remove empty rows. 3.9.3 Import from Google Sheets. Export to XML files. Connector for Tableau Online. Desktop: EasyMorph Launcher replaced EasyMorph Scheduler. New example - "2 spreadsheets merged". 3.9.2 Explicit column-to-field mapping for the "Export to database" action. Uploading/downloading files and folders from/to Amazon S3. Desktop: Full window table view. Full table search. New workflow for adding data. Server: Authentication via Active Directory. Option for prompting task parameters on start. 3.9.1 Advanced data types for creating database tables. Publishing datasets to and receiving from EasyMorph Server. Auto-documentation for queries. The "Other SQL" dialect. Desktop: Server Link. Project thumbnails. Thumbnail editor. 3.9 SFTP, SCP file transfers. Fetching emails with attachements from IMAP and Exchange servers. Executing remote SSH commands. Import/export into native EasyMorph data format. The limit for actions/iterations in the free edition is reduced to 24. 3.8.2 New action "Create list". Updated data drivers. 3.8.1 New actions: Remove empty columns, Sanitize, Total/Subtotal, Keep min/max, Cross Merge. New functions: monthstart, monthend, weekstart, weekend, yearday, isoweeknumber. Desktop: Automated data quality suggestions. Quick export to file. Error cards for call/iteration errors. 3.8 Any transformation can be inserted at any position. Email connector for Exchange. SQL connector for Apache Hive SQL (experimental). Desktop: Column profiler with various counts and distribution histogram. 3.7 Conditional "if-then-else" workflows. Disabled state for transformations. New transformations: PowerShell Command, Replace, File Command, XSLT. New text editor for expressions and custom SQL queries/commands. Shareable, reusable connectors for Tableau Server. Import of SPSS .sav files. Export to 1010data. Database connectors specified by parameters. Compatibility with EasyMorph Server v1.3. See Release notes v3.7 for more details. 3.6.3 Bugfix: degraded performance on wide tables (>10'000 columns). Bugfix: columns with valid names could be automatically renamed in some cases. Bugfix: Windows 10 Fall Creator's Update (build 1709) made application freeze when showing progress popup. 3.6.2 Improved error handling for the "Export to database" transformation. Multiple commands in the Run Program transformation. See Release notes v3.6.2 for more details. 1.2 EasyMorph Server: Web file manager for downloading/uploading files and publishing projects through a web browser. Open-source EasyMorph Server .NET SDK and a command line API client for the Server. See Release notes v1.2 for more details. 3.6.1 Support for quoted line breaks in delimited text files (as per RFC 4180). Publishing projects to EasyMorph Server v1.2. Date literals and comments in expressions. Improved export to Tableau. Append mode for export to text. See Release notes v3.6.1 for more details. 1.1 EasyMorph Server: Continuous schedule; file picker and date picker for parameters; search for tasks; support for the Status transformation. 3.6 Loading multiple uniform files without using iterations. New transformations: Import fixed width text, Split fixed width text, Split delimited text, Regular expression, Download file, Status, Fill right, Select with lookup, Convert data type. New functions: system(), filename(), combinepath(). Publishing TDEs to Tableau Server. Support for SAP HANA. See Release notes v3.6 for more details. 1.0 EasyMorph Server: Web console. Schedules: Once, Hourly, Daily/Weekly. Real-time task logs in the web console. EasyMorph Server Monitor. 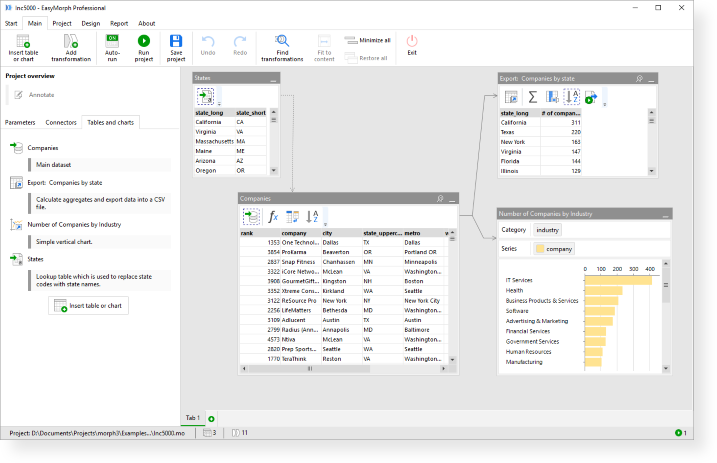 3.5 Visual WHERE condition builder for database queries. New Filter pop-up (replaces the Unique Values pop-up). New transformations: "Filter by search" (with support for regular expressions), "Delete database rows", "Delete matching database rows", "Select matching database rows". File splitter (partitioner) for large text files. Full outer join in the Merge transformation. Fuzzy matching in Match transformation. Support for DB2 and Vertica. See Release notes v3.5 for more details. 3.3 Direct export to databases (via SQL INSERT). New Query Editor tool and standalone database queries. Custom connection properties for database connectors. Black/white-listed database schemas in database connectors. "Interval merge" transformation. Faster QVD reading. Run/Iterate program removed from the free edition. See Release notes v3.3 for more details. 3.1 New transformations: Running total, Iterate another table, Rename with lookup, Generate UIDs. Support for data type Date in Export to Tableau. New commands in "SQL command" transformation: Create table, Delete table, Delete rows. New functions: mirror, roundxl, now. Annotations for parameters. Support for Amazon Redshift. See Release notes v3.1 for more details. 3.0 Basic PDF reporting. Import from XML files. New transformations: Clean Up, Shift Column, Match, Call and Input. New functions: substringcount, padstart, padend, removetext, removechars, keepchars. See Release notes v3.0 for more details. 2.8.1 Cumulative update for patches 2.8.0.x. Two new transformations: Pivot and SQL Command. New functions: when, iferror, compact and round. See Release notes v2.8.1 for more details. 2.8 Background pro-active calculation. Asynchronous execution. Drag-and-drop charts. Annotations for tables and transformations. Import from PosgreSQL databases and SAS files. See Release notes v2.8 for more details. 2.5 Major release with native DB connectors added. See Release notes v2.5 for what's new, and changes.